Megan Rose MacLeod is a witch whose day of reckoning is at hand. After asking for a favor years ago, it is now time to repay her debt. All Hallows Eve, and the time where the thin veil between realms will slip away, and her Aunt Rose is sure they will need protection against any evil spirits. Her aunt also believes Megan should forget her foolish vow from years prior but she signed a magical document and that meant something. Tieran Fairlove is certain that the woman he has searched for all his life, to be his mate, is Megan. As King of faeries, he remembers the first time she came to him and now he expects her to repay the good deed she was granted. Megan decides she must meet Tieran. He is in love with her and tries to assure her she feels the same for him, even though she can't admit it. In the midst of events the veil of the worlds begins to lift and Megan finds her village under attack and she begs Tieran for his protection. Her family has told Megan that he is a monster, but after everything begins to come to a close, she sees that he is nothing like the others expressed. 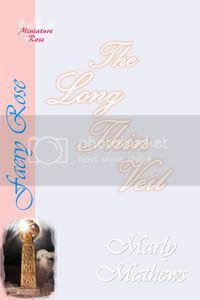 The Long Thin Veil is a cleverly composed story with refreshing characters that lend pleasure to the tale. Megan's bravery shines throughout not only facing up to her debt but standing up and believing in Tieran. He is a sweet and caring soul that shows much compassion and warmth. Marly Mathews takes a story of two people that are meant to be together but have yet to really figure it out until history brings them back together and they discover a love that was meant to be. They both share something that no other understands in this easy flowing dazzling tale that leaves a smile on this readers face. 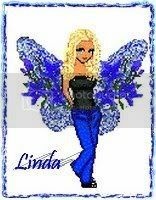 I have to say a big thank you to Linda L. at Fallen Angels Reviews for such a fantastic review! I'LL BE YOURS IS OUT!!!! I'LL BE YOURS has been released at NEW CONCEPTS PUBLISHING! This is such a great unexpected surprise for me since I wasn't sure of the final release date! I was so happy when I discovered it in the Hot New Romance section on the website. New Concepts has also revamped their homepage with a lovely new banner! I love it! Wow...I'm still floating on cloud nine. January was really getting to me...but now I have a little early spring in my life! Okay I'm off to do some more happy dancing! A yellow rose is the symbol of hope. As a yellow rose you want to be and feel optimistic. ~*~Wish~*~ You wish people wouldn't fuss so much over what's wrong and think more about what's good. People Say ^_^ Things are so bad! You Reply ^_~ But they could be so much worse! Here's another fun quiz for everyone on this cold Wednesday morning. Man, I'm not a fan of January. UNICORN = Unicorns are magical horses with one horn protruding from there forehead. The horn is the source of their magic. To see a unicorn is considered good luck because they are so reclusive and shy, and to touch their horn insures good fortune and indicates a pure nature. Here's a fun quiz for a cold Tuesday! If you're looking for a lighthearted romantic comedy from the 1940's then this movie is a good pick! :) It's set in Washington, DC during the Second World War and stars, Jean Arthur, Charles Coburn and Joel McCrea. First Review for The Promise! I just received my first review from Fallen Angels Reviews...and it's a great one! Yay! Special thanks to the reviewer Lena C. for taking the time to review The Promise! Holly St. Christian is alone in the world, her last relative passed away and now with Christmas coming she has no one. That is until a man name Nathanial calls her saying that she must come to Winterbourne. For some reason she feels comforted by Nathanial and not sure what to do, she takes a risk. However all is not as it seems for the Nathanial that rescues her one snowy night sounds like a stranger, making her wonder if coming to Winterbourne was a mistake after all. Does love at first sight exist in this time or is it just Holly’s imagination that she feels Nathanial is someone that used to be important in her life? Nathanial does not know what game Holly is playing nor does he care that somehow this waif of a woman has gotten under her skin in such a short time. Rescuing her that snowy night somehow changed his life but he doesn’t know how or why he feels a strong pull of attraction towards Holly. Magic is in the air and he knows for some bizarre reason that if Holly walks out of his life his chance of finding love will be gone forever. Can he take a risk like Holly and for the first time in his life believe in falling in love at first sight? This is my first exposure to Marly Mathews and I can see that this author will be going places at Wild Rose Press. Her imagination has sparked mine to the point where you can feel Nathanial and Holly’s love, but also hate Nathanial for denying his attraction towards Holly. I liked the fact that even though it was a short story there was comedy blended in with the warmth of the family. This book sweetened my heart. Throughout the book you can feel how loving the family is in the book and what Holly needs is family. This abiding love makes this a beautiful story and right for the holiday season. Marly Mathews did a great job in this sweet romance for it has all three things a romance should have, romance, miracles and the possibility of a love that last at all times. And, here's the link for the review as it's posted on the site for Fallen Angels Reviews!